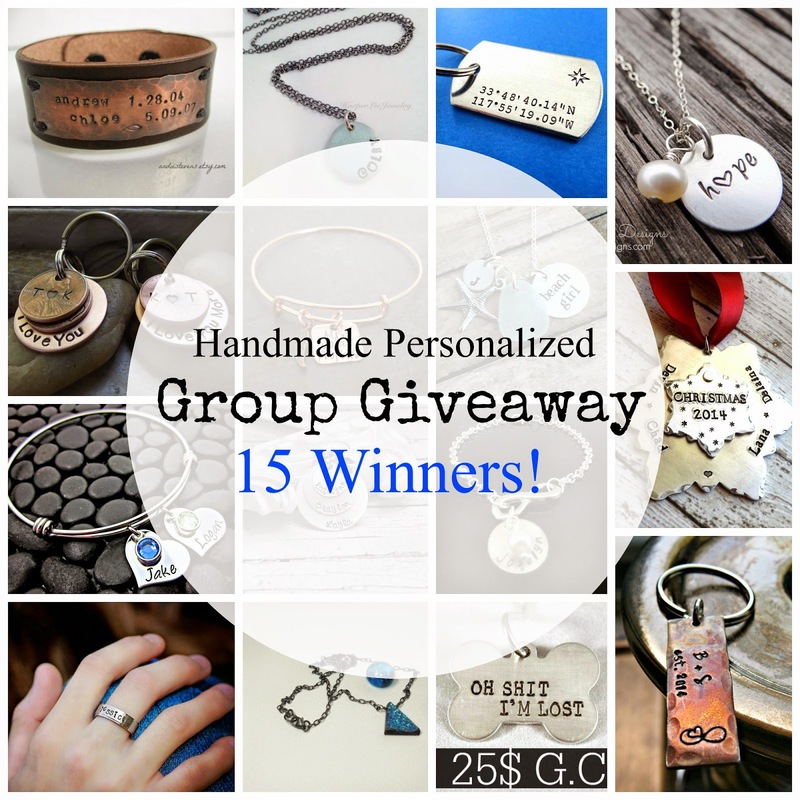 Handmade Personalized Group Giveaway // Fifteen Winners! You all know me and how much I love running giveaways, this time its something different and its HUGE. You don't want to miss out on this opportunity, specially with Christmas right around the corner. 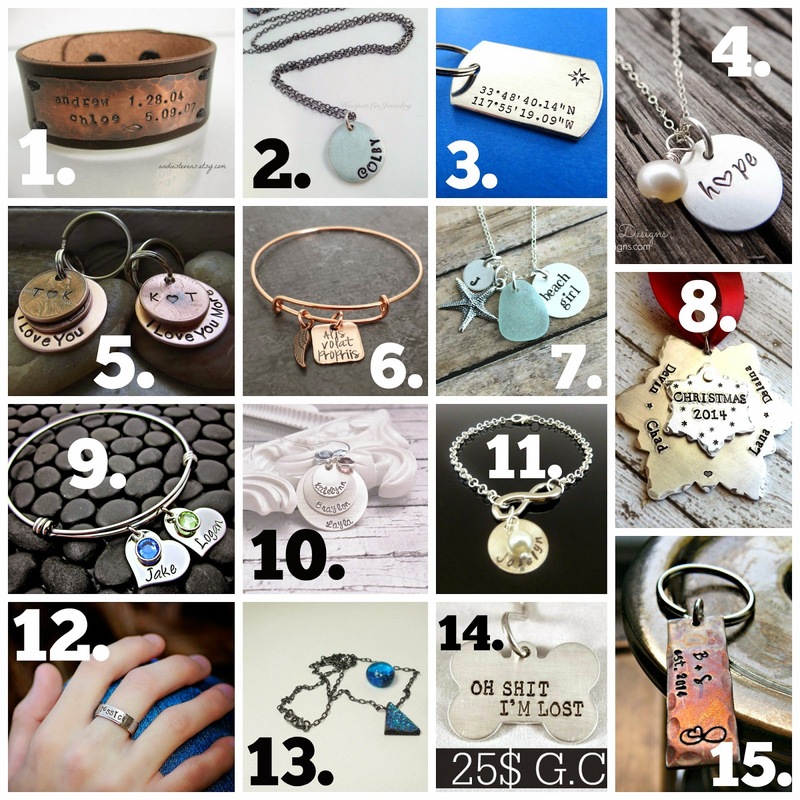 Its the largest group giveaway ever for all 100% hand crafted homemade, hand stamped personalized jewelry and accessories!! I have been part of this amazing Etsy and Facebook team for years now called handstampingcrazies, this is where all of us women got together to host this amazing giveaway for you all. Special thanks to all you ladies who are participating in our first giveaway ever! The best part? There are 15 winners, YES you read that right. The odds are in your favor. The giveaway is open for 7 days, each winner will be emailed after it ends. Please make sure your providing a good email address. If you don't respond within 3 days it will go on to the next winner. Lets show our support and thank these amazing shops//stores that offered their time and talents to make this a successful and brilliant giveaway! Depending on which item I won, I would have different people to gift the prize to. This is an awesome giveaway!!! Thanks so much for the chance. I only have time to do some of the entries tonight, but I'll come back and do more later. I would give a present to either my sister or husband. If I win, I want something for myself. Is that bad? I would give something to my boyfriend or a coworker. If I won, I would give whatever I won to my Mom! She would love all of the items!! I would get something for my mom! If I won, I would give the gift to my mom, sister, or best friend. I like the Custom Hand Stamped Snow Glove Christmas Ornament. I would give gifts to my mom and sister! I would definitely get something for my mom. She has helped me so, so much with my daughter for the last year and has been the best mother and grandmother to my daughter that I could ever wish for. Thank you for this amazing giveaway!! I turned 50 this month so I would put the gift card toward a present for myself. Normally I would put it toward Christmas presents but since I hit the big 50 I have decided that if I won I would buy myself something special! If I win I would give to my children for sure! There are so many gorgeous items, ohhh I just love them! Depending on which item, but I would give to a family member or a friend. Maybe even a teacher.